While the debate centers on gay marriage, what is missing is a serious discussion about the family breakdown. Jonah Goldberg wrote a piece recently about how Dan Quayle was right about the family's collapse twenty years ago and its meaning for the greater society. While much of the establishment mocked Dan Quayle, Quayle has proven to be right and his critics wrong. 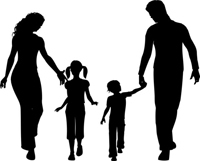 While much emphasis has been made on education, family structure is as strong a factor in determining future economic rise or failure as education. Married women are less likely to live in poverty. Only 15% of women who are married and without a high school diploma live in poverty, whereas 47% of single female heads of household dropouts live in poverty. 31% of single female head of households with high school diploma live in poverty compared to only 5% of married families and 24% of single female head of households with some college degree live in poverty compared to only 3.2% of married women live in poverty. Nearly 9% of women with college degrees or higher live in poverty compared to 1.5% of married families with college degree or higher. Note that a married couple with a high school education is almost half as likely to live in poverty as a female heads of household with a college degree! Something has obviously gone horribly wrong with family formation; the hardest hits are minority women and children. Marriage is the key to eliminating poverty because it causes husbands to earn more for the family. As Kay Hymowitz pointed out, "Marriage itself, it seems, encourages male productivity. One study by Donna Ginther and Madeline Zavodny examined men who’d had 'shotgun' marriages and thus probably hadn’t been planning to tie the knot. The shotgun husbands nevertheless earned more than their single peers did." Some consider this benign, and others oppose the idea that we should worry about judging which family structure is better. Salon writer Sally Kohn stated, “The gay rights movement may give cover to or even amplify a set of narrow values that rank married families as better than unmarried families, two parents as better than one parent — norms that continue to divide America into good people and deserving families versus everyone else.” Why have debates on gay marriages when many of the elites supporting gay marriage are derisive about marriage as an institution? Sawhill added that children raised by two parents do better in schools, are less likely to get pregnant or get arrested, plus they will obtain higher levels of education and achieve greater economic gains. This is not to say single mothers are not good mothers or their children not capable of great things, but it can’t be denied that a child is better off in a two parent household. As we debate gay marriage, we must understand that there is a price when tinkering with family structure. This is not an argument for or against gay marriage but it is cautionary tale: family structure matters.